The coolest East meets West Popular Culture event is back again this year with the Singapore Toy, Game & Comic Convention (STGCC) juicing up the pop culture universe with offerings from the worlds of toys, games, comics, anime, manga and collectibles. Attracting over 40,000 visitors last year, STGCC 2014 looks to build upon that success as the good people from Reed Exhbitions aim to bring all popular culture fans an event that they will never forget. From the highly popular Cosplay Runway to the fantastic Artist Alley, there will be something for everyone to do. Not forgetting the Walk of Fame where fans can get up close with their favorite artist for signatures and photos, this is going to be one event not to be missed. 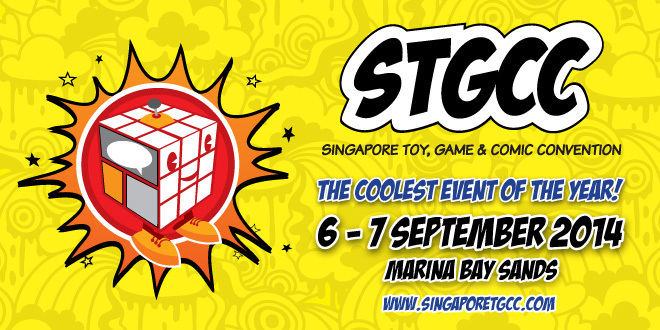 POPCulture Online is once again delighted to be a Media Partner of STGCC. The team will be on the ground getting the latest scoops and interviewing the many artist and personalities at the event. Do remember to check back here for updates and coverage from the event itself. If you see any of us, do say hi as we always love to see our readers at events.